By interfacing brain cells with graphene, University of Illinois at Chicago researchers have differentiated a single hyperactive Glioblastoma Multiforme cancerous astrocyte cell from a normal cell in the lab — pointing the way to developing a simple, noninvasive tool for early cancer diagnosis. In the study, reported in the journal ACS Applied Materials & Interfaces, the researchers looked at lab-cultured human brain astrocyte cells taken from a mouse model. They compared normal astrocytes to their cancerous counterpart, highly malignant brain tumor glioblastoma multiforme. In a lab analysis, the cell is draped over graphene, explains Vikas Berry, associate professor and head of chemical engineering at UIC, who led the research along with Ankit Mehta, assistant professor of clinical neurosurgery in the UIC College of Medicine. “Graphene is the thinnest known material and is very sensitive to whatever happens on its surface,” Berry said. The nanomaterial is composed of a single layer of carbon atoms linked in a hexagonal chicken-wire pattern, and all the atoms share a cloud of electrons moving freely about the surface. Funding was provided by UIC. Ultrasensitive detection, mapping, and monitoring of the activity of cancer cells is critical for treatment evaluation and patient care. Here, we demonstrate that a cancer cell’s glycolysis-induced hyperactivity and enhanced electronegative membrane (from sialic acid) can sensitively modify the second-order overtone of in-plane phonon vibration energies (2D) of interfaced graphene via a hole-doping mechanism. 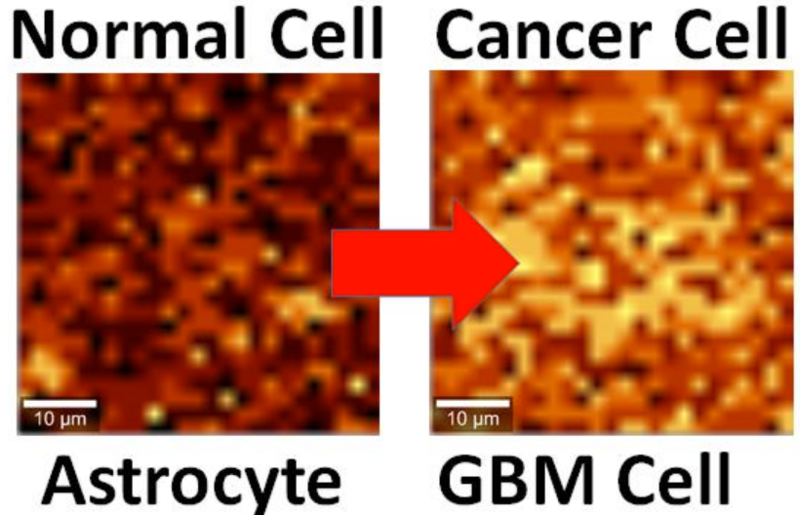 By leveraging ultrathin graphene’s high quantum capacitance and responsive phononics, we sensitively differentiated the activity of interfaced Glioblastoma Multiforme (GBM) cells, a malignant brain tumor, from that of human astrocytes at a single-cell resolution. 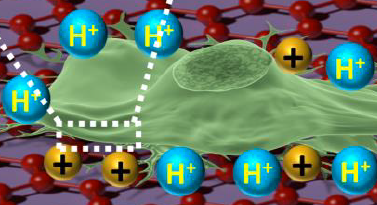 GBM cell’s high surface electronegativity (potential ∼310 mV) and hyperacidic-release induces hole-doping in graphene with a 3-fold higher 2D vibration energy shift of approximately 6 ± 0.5 cm–1 than astrocytes. From molecular dipole-induced quantum coupling, we estimate that the sialic acid density on the cell membrane increases from one molecule per ∼17 nm2 to one molecule per ∼7 nm2. Furthermore, graphene phononic response also identified enhanced acidity of cancer cell’s growth medium. Graphene’s phonon-sensitive platform to determine interfaced cell’s activity/chemistry will potentially open avenues for studying activity of other cancer cell types, including metastatic tumors, and characterizing different grades of their malignancy.